The key elements that comprise Competency Area #2 are outlined below. These can be used as touchpoints in determining whether your TA project helps advance your ACO or CP in this competency. Provider and care team engagement: ACOs and CPs engage clinical and community-based care leaders, providers, practice-level care team members, and other individuals involved in member care in the design and implementation of models of member engagement and care, and organizational leadership and governance in order to ensure that clinical perspectives and expertise, as well as on-the-ground experience caring for MassHealth members, are prioritized in the organization’s overall strategy and decision making. Responsiveness to provider and care team concerns and priorities: ACOs and CPs understand and effectively respond to the concerns and priorities of clinical and community-based care leaders, providers, practice-level care team members, and other individuals involved in member care, in order to ensure that their organizational culture supports a strong and stable workforce and advances the organization’s strategy for improving health outcomes and member experience and decreasing total cost of care for MassHealth members. Education, training, and other resources for providers and care teams: ACOs and CPs facilitate access to relevant education, training, and other resources in order to support a strong and stable workforce and ensure that all clinical and community-based care leaders, providers, practice-level care team members, and other individuals involved in member care can engage capably and confidently in new models of care. ACO/CP Integration: ACOs and CPs create and facilitate access to forums, tools, and resources that promote engagement, collaboration, and shared understanding among clinical and community-based care leaders, providers, practice-level care team members, and other individuals involved in member care in ACO-CP partnerships in order to ensure that MassHealth members with the most complex behavioral health, long-term services and support, and health-related social needs benefit from comprehensive and seamless systems of care. 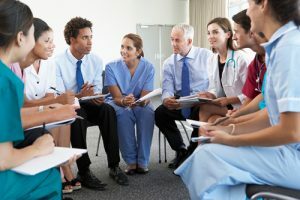 Train ACO medical assistants in team-based care: An ACO engages a TA vendor to conduct trainings for the medical assistants employed across all of the ACO’s sites. The training will prepare medical assistants to work at the top of their roles and engage as effective members of their care teams. Because the ACO’s medical assistants are at the heart of the care model, it is critical that the medical assistants feel empowered to participate in high value, low cost care through everyday interactions with members and other providers. This project also addresses Competency Area #1 in that medical assistants are often hired from the community a practice serves and thus may have a unique ability to engage with and translate the needs of MassHealth members. The project also addresses Competency Area #5 in that it provides training that advances the ability of care team members to engage confidently and competently in new models of care. Provide coaching and support for CP care team members as they implement a quality improvement framework specific to Care Coordination and Care Management: A CP engages a TA vendor to work closely with care team members as they implement a quality improvement framework that identifies areas for improvement related to care team functionality, competencies, and process workflows. This TA project will help the CP leaders build the capabilities and confidence among care team members that are needed to continually improve the CP program. Understand ACO staff perspective on value-based payment: An ACO engages a TA vendor to conduct focus groups with clinical and frontline care teams across all of the ACO’s primary care practices in order to understand the provider perspective on the transition to value-based payment, and subsequently improve provider buy-in to APMs. Focus groups will also enable the ACO to better understand what is needed for staff success in APMs in terms of data and reporting, tools, and staff training. ACO leadership will use the perceived barriers, windows of opportunity, and areas of concern of the providers and frontline care team members as the foundation for developing new workflows and care team protocols across the organization.